All you need to create a character and play. Publisher's blurb: "An immersive Lifepath character creation system, that allows you to choose from a wide range of backgrounds, from crazed Dog-Warrior, to empathic Tohaa. Choose or roll to create the character you want, defining options such as attributes, faction, heritage, homeworld, social status, education, and career. Select your starting gear from a wide range of equipment such as the hacking device and programs you'll utilise, or the type of weapon and ammo you prefer. "All the 2D20 rules you'll need to play, including Heat, Momentum, task resolution, and the triple dynamics of Warfare, Infowar, and Psywar. 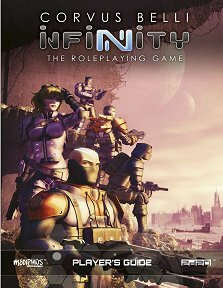 A gazetteer of humanity's near future, covering the systems and factions of the Human Sphere and beyond. Bonus content exclusive to the Player's Guide including the Agent Handler guide, 2d20 to N3 conversion guide, and stats for the iconic miniatures produced for this very RPG."